This article describes the journey of Bhima, Arjuna and Krishna from Indraprastha to Magadha to meet Jarasandha, the king of Magadha and to defeat him. This article is part of a series of articles related to narrations of journeys mentioned in Mahabharata. These travel narratives are extremely important for researchers who study about the ancient geography that existed during the period of Mahabharata. Important places inside the city. King Yudhisthira wanted to perform the greatest of all sacrifices performed by the kings viz. the Rajasuya sacrifice. This involved military activity along with the usual sacrificial rites like in the case of an Aswamedha sacrifice. In Aswamedha, a horse is let loose from the country of the king and the king's representative (usually a military general) had to defeat all the kingdoms entered by the horse. Any other king who want to avoid battle had to let the horse travel through his kingdom unharmed and if he wanted battle he would bind the horse. In case of Rajasuya, no horse was let loose, but the king's armies would march under his appointed military generals in four cardinal directions and defeat all the kingdoms encountered in their paths. Like in Aswamedha, any kingdom can chose to accept the sway of the king peacefully or choose to battle against the king's military general. The impediment for Yudhisthira's Rajasuya was the kingdom of Magadha and its powerful king Jarasandha. Jarasandha was a formidable power. His military might was greater than that of the Kurus. Hence, in a formal battle, Yudhisthira's army will be defeated by Jarasandha. A solution for this problem was found out by Krishna. He knew Jarasandha was a skilled mace fighter and that he liked to engage in dual-fight with capable opponents. Krishna's idea was to make Jarasandha fight with Bhima who was a great mace-fighter among the Kurus. It was anticipated that Bhima will somehow kill Jarasandha in a dual fight. In the military campaign that ensued for the Rajasuya that was to commence, Bhima was chosen to conquer territories in the east which included Magadha. Hence the destruction of Jarasandha, the king of Magadha was especially important for Bhima from the point of view of a military general having the responsibility of the eastern territories. In the three member team, Bhima was thus the key member. Krishna was the key strategist and adviser. Arjuna was sent along with Bhima to enhance the strength of the three-member team. King Yudhisthira thus sent the best two among his generals for this risky task due to the seriousness and dangers involved. Krishna's duty was to bring back those two beloved brothers of Yudhisthira back to Indraprastha, without injury after successfully accomplishing the mission. Jarasandha's empire extended from Surasena (Mathura, western-Uttarpradesh) in the west to Pundra (Purnia, eastern-Bihar) along the river Ganga with Magadha (south-western Bihar) as its center of power. The empire contained within it kingdoms allied to Jarasandha or defeated by him, like the Surasena, Dasarna, Chedi, Vatsa and, Kasi in the west of Magadha and Anga and Pundra in the east. Mbh.2.20:- The trio Krishna, Arjuna and Bhima, all possessed of great energy, set out for Magadha attired in the garb of Snataka Brahmanas. Having set out from the country of the Kurus, they passed through Kuru-jangala and arrived at the charming lake of lotuses. Passing over the hills of Kalakuta, they then went on crossing the Gandaki, the Sadanira (Karatoya), and the Sarkaravarta and the other rivers taking their rise in the same mountains. They then crossed the delightful Sarayu and saw the country of Eastern Kosala. Passing over that country they went to Mithila and then crossing the Mala and Charamanwati, the three heroes crossed the Ganges and the Sone and went on towards the east. At last those heroes of unfaded glory arrived at Magadha in the heart of the country of Kushamva. Reaching then the hills of Goratha, they saw the city of Magadha that was always filled with kine and wealth and water and rendered handsome with the innumerable trees standing there. The places mentioned in the above narration are not in proper geographical order. Map shows the path followed by the trio (Bhima, Krishna and Arjuna) as they traveled to Magadha. The map also shows the regions under the power of Magadha king Jarasandha, as a dark band. This band extended from Surasena in the west to Pundra in the east and thus included territories that lied to the south of Kuru-Panchala and Kosala-Videha kingdoms. Another way was to travel along Yamuna river that flowed near by Indraprastha itself, and then join Ganga to reach Magadha. But this would require passing through Mathura (capital of Surasena kingdom) which was then under the control of Jarasandha. They could as well traveled along Gomati river. The trio avoided the territories of kings who had strong alliance with Jarasandha or the territories that were under the direct control of Jarasandha or the Magadha army which included the kingdoms that lied in the southern banks of Ganga-Yamuna, like Kasi, Vatsa, Chedi, Surasena etc. They mostly traveled along the territories of the kings who though suffered the dominating power of Jarasandha was not yet in direct control of Jarasandha. Hence the route wasn't the shortest one but the one that offered more secrecy and safety. Thus the route was charted along the southern foot-hills of the Himalayas along the kingdoms like Kosala and Videha. A route along the foothills of Himalayas also help the travelers to cross the rivers easier as the rivers would be thinner close to their sources. A route along the Ganga river in the plains (viz. the main Uttarapatha path) would be populated with people and busy with traders traveling with their goods, moved along the road or ferried along the rivers. All the travelers would be checked by the soldiers of Jarasandha, who controlled this route. The route that lied to the immediate south of Himalayan mountains, was another Uttarapatha route leading to Pragjyotisha, passing through the Kirata territories. This whole route was controlled by another powerful king named Bhagadatta who ruled at Pragjyotisha (Gohati in Assam). He was as powerful as Jarasandha. However he was somewhat allied towards the Pandavas due to a friendship he had with king Pandu, the father of the Pandavas. Bhagadatta, like Duryodhana had made truce with Jarasandha. Hence there was no war between this great powers, which could have mutually destroyed them or weakened them. The populated regions of the Kuru kingdom (during the reign of the Pandavas) lied between Ganga and Yamuna rivers, centered around Hastinapura (Hastinapur, east of Meerut in Uttarpradesh). Formerly, the place where the city of Indraprastha (in Delhi) was built, was considered as part of the region named Kuru-jangala (meaning the bush-lands or the forests of the Kuru country). It was considered as a hinder-land of the Kuru territories. Kuru-jangala region extended from the banks of Yamuna river westwards in what is now part of Hariyana and Delhi. Once the city of Indraprastha was built, the immediate region where it lied was considered as part of Kuru country and the rest of Kuru-jangala remained as Kuru-jangala itself. Thus, the trio set out from Indraprastha (Kuru-country) and passed through Kuru-jangala that lied to the north of Indraprastha. The location of the charming lotus lake is uncertain. Kalakuta (Kalagarh) was one of the southern most ranges of lower Himalayan mountains. It is discussed in detail in the article named Pandu-s-travels. Kalakuta lied in the territories controlled by the Kurus. After that they entered territories beyond the direct control of the Kurus. Passing along the southern foothills of Kalakuta, the trio crossed the Sarayu (Ghaghara) river and reached the territories of eastern-Kosala. During the period of Ramayana, there was only two kingdoms named Kosala. One was the southern Kosala (Chhattisgarh), the native place of Rama's mother Kausalya and the other was the northern Kosala ruled by Rama, that lied on the banks of Sarayu with Ayodhya as its capital. During the period of Mahabharata, both these Kosala territories divided into several kingdoms. The eastern Kosala was one among them. It was part of the Kosala ruled by Rama from Ayodhya. Eastern Kosala was subsequently ruled by Dasarathi-Rama's son Lava who had the city of Sravasthi as his capital. To the west of Sarayu lied the western Kosala which had Naimisharanya (in Sitapur) district as its western boundary. To the south of Sarayu lied the territories of Kosala proper with Ayodhya as its capital. This region was however then influenced by the power of Jarasandha. The kingdom of Videha (northern Bihar) lied to the east of the Kosala territories. It was home to Sita, the beloved wife of Rama of Ayodhya, during the period of Ramayana. Its capital was Mithila. The trio crossed the Gandaki river to enter into the territory of Videha and then went to the city of Mithila (Janakpur, in Nepal close to Indo-Nepal boarder). Sadanira was a river that lied to the east of Gandaki. Sometimes the name Sadanira was applied to Gandaki itself. However more accurately Sadanira is identified with the Budhi Gandak river. This river however was an old channel of Gandaki. It now lies to the east of Gandaki and runs parallel to Gandaki. K.M.Ganguli, the English translator of Mahabharata has wrongly identified Sadanira with another river named Karatoya. Karatoya (Korotoa) river lied to the east of Gandaki, Sadanira and Kausiki (Koshi_River). It now lies in Bangladesh. It was part of another kingdom named Pundra. The king of Pundra was an ally of Jarasandha and hence it is less likely that the trio will travel to this kingdom. Sarkaravarta river lied to the east of Sadanira. It is identifiable to modern day Bagmati_River. It is also called Bagvati in Vishnu_Purana. The Svayambu and the Vardha Purana call it the Vagmati. Even though thus mentioned in the Puranas, no river is mentioned with similar named in Mahabharata. It is possible that its name during Mahabharata period was Sarkaravarta, which during the Puranic period, became Vagmati, a name which it retains now as Bagmati. Currently it joins the Kausiki (Koshi) river. But in ancient time,s Kausiki was further in the east and hence Bagmati (Sarkaravarta) joined Ganga instead. Mala river is identifiable to Kamala_River that flows close to the city of Mithila (Janakpur). This river joins Bagmati (Sarkaravarta). Charamanwati river is identifiable to the river Mainawati a tributary of Kamala (Mala) river. Some narrator of Mahabharata seems to have influenced here by another river named Charmanwati (Chambal), a tributary of Yamuna, that lied in the far west and misinterpreted Mainawati to Charamanwati. The trio while traveling around Mithila crossed Mala (Kamala) and Charamanwati (Mainawati). Then they traveled along Sarkaravarta (Bagmati) and reached Ganga. Once the trio reached Ganga, they traveled westward through Ganga (in some boat) to reach its southern tributary viz. Sone or Swarna (Son_River). After traveling along Swarna river for some time in a southward direction, they turned east which was the territory of Magadha. Swarna river was the western boundary of Magadha. Much before Jarasandha, during the period of Ramayana the whole region was ruled by king Kusamva, who ruled it from his city named Kausambi. It was the capital of Vatsa kingdom. The whole region controlled by Jarasandha was then controlled by Kusamva and the kings in the Kushika race like Viswamitra. Viswamitra's territories included Kanyakubja (Kanauj), Vatsa, Kasi, Magadha, Anga and the regions lying along Kausiki river. Viswamitra's rival, sage Vasistha, lived close to Gaya that lied within in the Magadha territories to the south-west of its capital Girivraja. The hills of Goratha was the south-western part of a mountain range that spanned in south-west to north-east direction. It lied 45 km to the north-east of Gaya. It had several peaks. These mountain ranges surrounded the capital of Magadha, viz. Girivraja like a natural fortress. Hence it was difficult for any army to sack this city. It was impossible of any army to defeat Jarasandha by attacking his capital city. The name Go-ratha (Go:-cow, bull; ratha:-chariot, cart) means a cart-pulled by bulls or a bullock-cart. Probably the supply wagons (bullock-carts) that went to the city for supplying goods to it passed beneath this hill. The trio ascended this hill to have a birds-eye view of the capital city of Magadha viz. Girivraja, which was surrounded by the mountains. Goratha hill is now called Bathani-ka-Pahad or Bathani hill. From a distance, it appears to have three peaks. It is around 9 km from the capital city viz. Girivraja. It lied to the north of Sandol hill. Mbh.2.21:- XXI Vasudeva (Krishna) said, behold, O Partha (Arjuna), the great capital of Magadha, standing in all its beauty. Filled with flocks and herds and its stock of water never exhausted, and adorned also with fine mansions standing in excellent array, it is free from every kind of calamity. The five large hills of Vaihara, Varaha, Vrishava, Rishigiri, and the delightful Chaitya, all of high peaks and overgrown with tall trees of cool shade and connected with one another, seem to be jointly protecting the city of Girivraja. The breasts of the hills are concealed by forests of delightful and fragrant Lodhras having the ends of their branches covered with flowers. They then approached towards the impregnable city of Girivraja that was full of cheerful and well-fed inhabitants belonging to all the four orders, and where festivities were perennial. On arriving then at the gate of the city, the brothers instead of passing through it began to pierce with their shafts the heart of the high Chaityaka peak. Girivraja, the city surrounded by hills. It lied 45 km north-east of Gaya. Click to Enlarge. Analyzing the etymology of the name Girivraja, (Giri:- hill; vraja:- pasturing ground, pastoral center, town) we have the meaning as the hill-town or the town surrounded by hills.. As per the narration five large hills surrounded the city. The five large hills named Vaihara, Varaha, Vrishava, Rishigiri and Chaitya are now known as Bibhraha-giri, Bipula-giri, Ratnakuta, Girivraja-giri and Ratnachala. These were the peaks of the mountain range that surrounded the city of Rajagriha like a fortress. These five hills are also mentioned in Bhuddhist-Pali texts as Gijjhakuta, Isigili, Vebhara, Vepulla and Pandava. The table below summarizes the name of five hills during the Mahabharata-era, Buddhist-era and current era. Sonagiri is between Udayagiri and Girivrajajagiri. Udayagiri joins Sonagiri at its south-eastern corner. The city Girivraja surrounded by these peaks was known as Rajagriha during Buddhist-era. This place name 'Rajagriha' still exist with the name 'Rajagir' Rajgir junction or center-point now lies towards the north of the northern-gate of the former city of Girivraja which lied within the natural-fortress formed by the hills. Northern Gate: This gate lied between the Vaihara and Chaityaka hills. It was called Surya Dwara or the sun-gate. It was protected by goddess Jara, the local deity worshiped at Girivraja. From the Mahabharata narration, we can understand that the trio entered the city through this gate after causing some damage to the Chaityaka hill. South-Western Gate: This gate lied between the Varaha and Vrishava hills in the west. It was called the Gaja Dwara or the elephant-gate. Southern Gate: This gate lied between Udayagiri peak of Varaha and Rishigiri in the east. There was also a fifth minor gate (Eastern Gate) that lied towards the east, between Chaityaka and Rishigiri hills. A river named Saravati flows through the hillside of the city and passes out from its northern gate. The river Vana-Ganga lied to the south of the city. The river Panchana flowed in the east beyond the hills. During the Ramayana-era, the river Swarna (Sone, or Son) flowed through the city. Jarasndha's palace situated in the western side of the city between the Vaihara and Vrishava hills in the west. The wrestling ground (Ranga-Bhoomi) of Jarasandha lied at the foot of the Vaihara hill, 1.6 km to the west of a cave named Swarna-Bhandara (the treasury of gold). Bhima's ground (Ukhara or the Malla-Bhoomi) was at the foot of Sonagiri, a peak of Varaha hill. Thus it stood to the south of Jarasandha's ground. The mace-fight between Jarasandha and Bhima took place in a level ground between these two grounds. The dual-fight lasted for thirteen days. On the last day, Jarasandha was killed by Bhima. Jarasandha had held many kings and princes who opposed him as his prisoners. The prison where they were kept, lied at the foot of Sonagiri, in the south. Thus it was on the side alloted to Bhima. It is not clear if the prisoners were able to see the fight between Bhima and Jarasandha from their prison. It is mentioned in Mahabharata that after killing Jarasandha, the trio caused Jarasandha's chariot to come beside them and rode it towards the prison. They then released the kings and princes who were in the prison. The north-eastward extension of the Chaityaka hill is known as the Giriyaka hill. The Panchana river flows by its side. This hill contains the famous tower known as Jarasandhu-ka-baithak where Jarasandha probably sat on a throne to look down upon his subjects. Jarasandha's son Sahadeva was installed as the new king of Magadha. He became an ally of king Yudhishthira. All the kings and princes who were held prisoners by Jarasandha, who were now set free, accompanied Bhima, Krishna and Arjuna to Indraprastha. They were treated with respect by Yudhisthira and were sent to their respective kingdoms. Those kings became allied to Yudhisthira and considered him like their emperor. This was thus the beginning of the rise of king Yudhisthira as an emperor. Magadha's rising empire thus became Yudhisthira's empire. 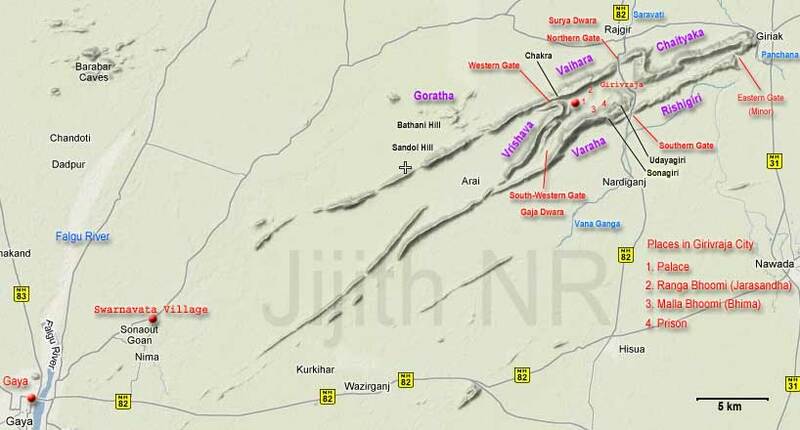 It is likely that a major portion of the huge army needed for conducting military expeditions in the four directions as part of Rajasuya came from Magadha. Some of the armies came from the kings who were set free from the prisons of Girivraja. However not all of the kings controlled by Jarasandha became favorable to Yudhisthira. Some of them were natural allies and friends of Jarasandha. They turned against Yudhisthira. Some of these kings were defeated by Bhima in his eastern-military campaign as part of the Rajasuya that ensued after the death of Jarasandha.